Running a university IT department can be complex and challenging, especially if you’re working with limited resources and less-than-cutting-edge infrastructure. Universities were some of the first organizations to go online. Decades ago, they were instrumental in creating a well-functioning, accessible internet. But since then, universities have struggled to balance restriction and flexibility, oversight and self-direction, standardization and creativity. It’s complicated, for sure. But the perfect balance is possible. Through our work with universities, Pantheon has seen forward-thinking IT teams accomplish incredible feats. We have collected three of our favorite success stories in our latest resource, The Higher Ed IT Playbook. These inspiring stories show the diverse ways that IT can bring people together, build consensus, and create amazing feats of web design. 1. Communication Is Essential: Before you develop a solution, get all the stakeholders talking to you and to each other. 2. Standardize on What Matters: Once you have everyone talking, you can determine crucial points of standardization. 3. Offer Flexibility When Possible: More options will generally lead to happier stakeholders, so flexibility matters. 4. Empower Stakeholders: It’s easier and safer than ever for stakeholders to spin up sites and handle their own upkeep. 5. Get All the Way Out of the Infrastructure Game: Managing hardware, making sure sites stay up and running, and dealing with traffic surges are all low-value tasks and better left to a managed cloud platform. 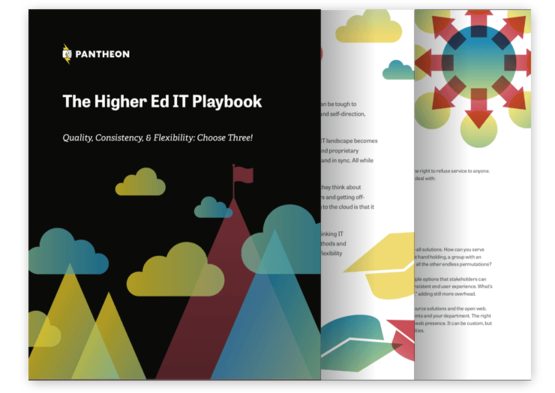 Learn how ASU, Penn, and Yale used these guidelines to migrate to the cloud and revolutionize their IT: Download The Higher Ed IT Playbook. Universities were leaders in adopting the internet. Now, they can be leaders in revolutionizing it. ASU, Penn, and Yale each created groundbreaking new models for university IT, pioneering the next generation of the open web. This ebook can help you do the same for your university. Download the playbook to learn more about how these three universities migrated to the cloud, what they learned from the process, and how you can convince stakeholders at your institution to invest in state-of-the-art infrastructure, too.